Nevion’s innovative Sublime X2 is a router series that punches above its weight. With its management, cross point and power redundancy, it features the reliability of large modular routers. A multi-core signal processing farm makes it a hybrid router. Its compact form factor makes it ideal for applications where size really matters. And its clever design, brings cost savings to its users. The router series features a routing level for the de-embedded and embedded audio. An optional AES extension, providing 32 AES I/O ports and scaling the routing level to a 96×96 AES router, makes the router the ideal choice for in-studio routing. 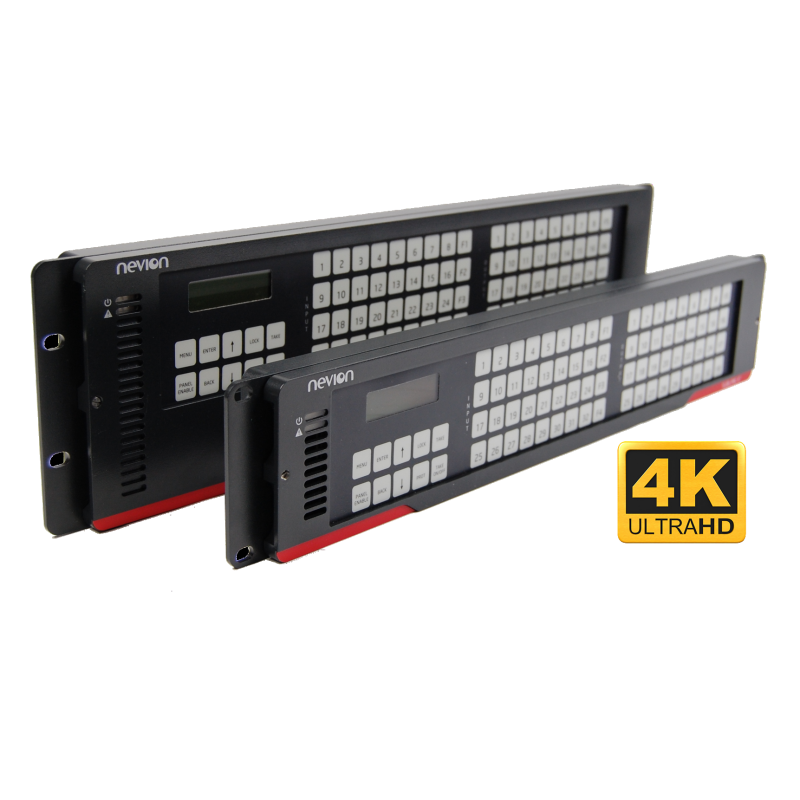 The 4K/UHD software upgrade for the Sublime X2 enables it to handle quad-link UHD/4K and 3G/HD/SD simultaneously through sectioning of the ports, allowing for virtually any routing configuration – both square (where the number of inputs matches the number the outputs) and non-square. Configurations can be changed easily on the fly, without interrupting the unaffected signals. The embedded system controllers provide a powerful web interface for control and management, SNMP support and support for multiple control panels enabling multi user control. Support for external router and 3rd party interfaces makes Sublime X² central to any routing system. 23626 SLX2-3GHD3232-CP-DIN 2RU 32×32 3G-SDI compatible compact router with DIN1.0/23 connectors, built-in controller with WEB interface, SNMP support and support for Nevion control panels. The router also features options for redundant controller, redundant cross point and audio/video processing modules. Single PSU included. 23627 SLX2-3GHD3232-CP-HDBNC 2RU 32×32 3G-SDI compatible compact router with HD-BNC connectors, built-in controller with WEB interface, SNMP support and support for Nevion control panels. The router also features options for redundant controller, redundant cross point and audio/video processing modules. Single PSU included. 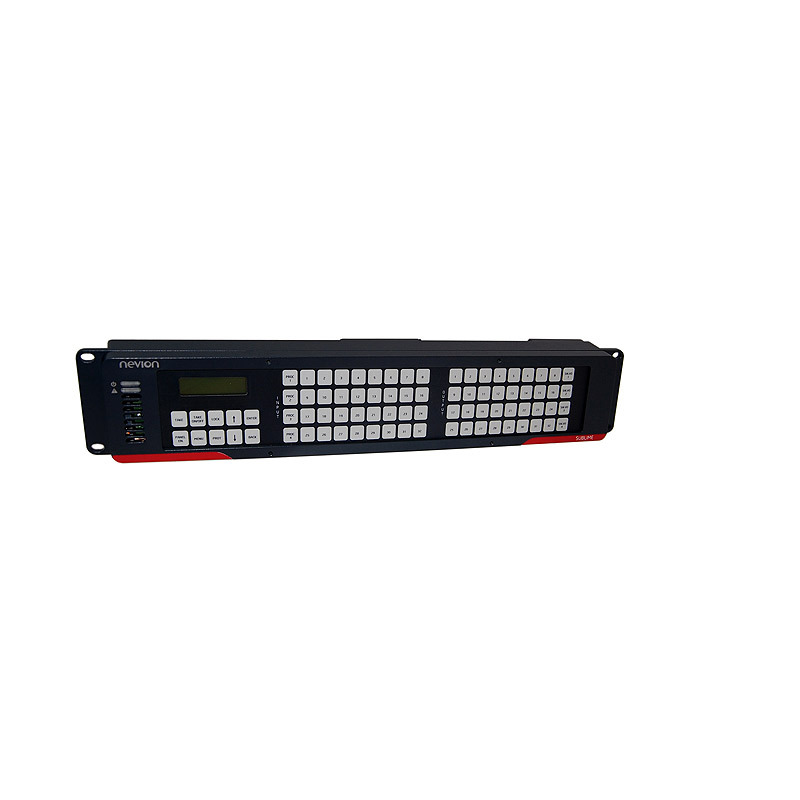 24042 SLX2-3GHD6464-CP-DIN 3RU 64×64 3G-SDI compatible compact router with DIN1.0/23 connectors, built-in controller with WEB interface, SNMP support and support for all Nevion control panels. The router also features option for redundant controller, redundant cross point and audio/video processing modules. Single PSU included. 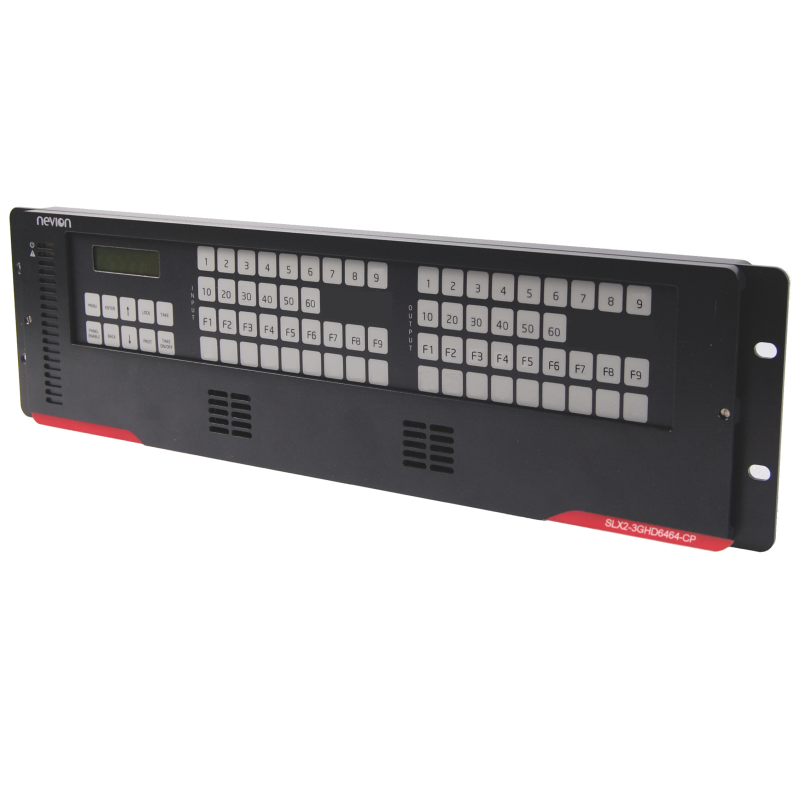 24043 SLX2-3GHD6464-CP-HDBNC 3RU 64×64 3G-SDI compatible compact router with HD-BNC connectors, built-in controller with WEB interface, SNMP support and support for all Nevion control panels. The router also features option for redundant controller, redundant cross point and audio/video processing modules. Single PSU included. 23631 SLX2-HW-AVPROC4 Hardware option for quad core processing board with 32 balanced AES I/O ports to Sublime X2 routers. HW only, processing features licensed separately. 23628 SLX2-HW-RC Hardware option for redundant controller to Sublime X2. 23629 SLX2-HW-RX32 Hardware option for redundant cross point to 32×32 Sublime X2 routers. 24053 SLX2-HW-RX64 Hardware option for redundant cross point to 64×64 Sublime X2 routers. 23630 SLX2-HW-VPROC4 Hardware option for quad core processing board to Sublime X2 routers. HW only, processing features licensed separately. 23637 SLX2-SW-3PP Software option for third-party protocols; Leitch Pass-through, Probel SW-P-02 and GVG Native. SLX2-SW-VX-WCTRL required. 24242 SLX2-SW-4K-ROUTE Software option enabling quad stream 4K routing thru an additional video level in the router. Both quad stream and single stream routings can be done simultaneously. The software is applicable for both 32×32 and 64×64 Sublime X2 routers. 23632 SLX2-SW-CQ1 Software license for single clean-switch core. The license provides one channel of error-free switching of line synchronous 3G/HD/SD-SDI. SLX2 HW VPROC# or SLX2 HW AVPROC# required. License key locked to physical MAC address. 23633 SLX2-SW-EMB1 Software license for single embedder core for Sublime X2. This license enables one 3G/HD/SD-SDI channel of de-embedding and embedding of 8 AES channels. SLX2-HW-VPROC# or SLX2-HW-AVPROC# required. License key locked to physical MAC address. 23636 SLX2-SW-VX-WCTRL Software license that enables the built-in controller to see other routers, and share its configuration with external Multicon system controllers. License key locked to physical MAC address. I want to know more about Sublime X2 3G-SDI compact router series enabled for 4K/UHD with option for redundant cross-point, redundant controller and multi-core signal processor.